The the Cubs broke out a can of whup azz on the Houston Astros last night coming back from 6-0 and 7-1 deficits powered by four HR’s, three of those by Aramis Ramirez. Was yesterdays announcement of Manager Lou Piniella’s retirement at the end of this season the catalyst for the Cubs big comeback win? You know, “Win one for the Skipper” and all that. Maybe, but perhaps there is more going on than meets the eye. As it turns out Tuesday was retirement day for more than just Piniella, University of Illinois at Chicago Head Basketball Coach Jimmy Collins also called it quits after 14 years at the helm. Another Tuesday announcement was by Chicago Bandits Pitcher and 2004 USA Softball gold medalist Jennie Finch who is hanging up the cleats to spend more time with her family. Collins works hard in the Chicago community and is the winningest coach in school history. Finch’s retirement is surely noteworthy and also gives me a reason to post a couple pics of the former winner of ESPN.com’s Hottest Female Athlete poll. Sorry, that may have come off a bit sexist, but I had nothing to do with the poll. Finch is more than just an athletic hottie however as recently as July 9 she pitched a perfect game for the Bandits against the Akron Racers and Time Magazine called her the most famous softball player in history. What does all this have to do with the Cubs? Well, Finch is married to Casey Daigle who pitches for current Cub opponents the Houston Astros, or should I say “did pitch” for the Astros as he and his 11.32 ERA were designated for assignment by the team July 18, the day before the Cubs/Astros series started. I think you’re starting to see how this all fits together, but there is more. Jennie Finch once struck out Albert Pujols (with softball from shorter mound distance) and the Cubs will play the Cardinals in a three game series following the current Astros series. Of course us Cubs fans think striking out Pujols is good on any occasion…um, somehow I kinda lost track of where this blog was headed…I’m blaming the Finch photos. OK let me tie this back together like any true superstitious fan would do by drawing illogical conclusions based on faulty and bizarre logic. 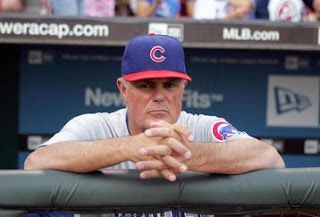 The Cubs put up 14 runs yesterday on a day of multiple public Chicago related retirements, now we need to find some new ‘retirements’ today so the Cubs can continue the retirement winning streak – it’s that easy! A quick google search of ‘announces retirement’ and bingo, I give you today’s winners – Survivor star and bad guy Russell Hantz and 1980’s-90’s Chinese Pop singer Dave Wang. Sure they may not carry the same inspirational quality as yesterdays group but I would think their retirement outta be good for a Cubs win today. The other upside here is that I/we now know who Dave Wang is (he’s also known as Wang Kit), never let it be said that Boys of Spring doesn’t spread a little international culture. In fact, here is a video of Wang doing his thang…singing that is. No idea what Wang is singing about in the video and not impressed with his voice. Upon further reflection I’m not as confident Hantz and Wang have the mojo to get it done. The Cubs took a 1-1 game into the 12th inning today but are now down 4-1 going into the bottom of the 12th, they need another big comeback right now. Let’s go boys, “Win one for the Wang”! As far as replacing Lou Piniella, it appears that it will be a lengthy process to find the new Cubs skipper. Like everyone else I have some opinions on who might be the best fit but I want to take in more information about the possible candidates before blogging about it.